Historic machinery has a special place in our psyche: the incessant splashing of water on the waterwheel, producing endless silent power; the rhythmic rumble of wooden gears powdered white, trimmed with cobwebs, and the singing of well-adjusted millstones grinding warm sweet-smelling flour; the creaking of windmill machinery turned by the magic of an invisible force, completely uncontrollable, yet harnessed in the service of man for centuries; or the swish of a stationary steam engine, the rhythmic rush of giant gleaming rods back and forth, turning wheels silently with awesome power. All machinery was built for a practical purpose: to provide a service or earn a living. But engineering embodies ingenuity and so it moves ever onwards, producing faster, more powerful, more efficient machinery. What happens, then, to old machinery when it becomes obsolete? The first problem is how to protect it. 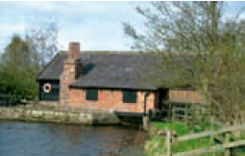 Above: Stretton Mill near Wrexham is a complete, traditional flour mill owned by Cheshire County Council and operated by a small employed staff trained by professional millwrights. The Mill is open to the public during the summer months and mills flour regularly. 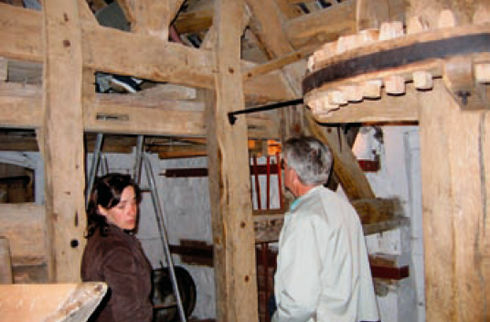 Above left: Much machinery is made of timber dating from the 18th and 19th centuries. Wooden machinery can often continue to work safely, provided it is free of major defects and joints are kept tight. 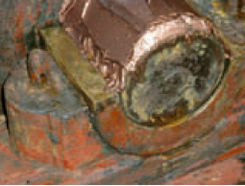 Above right: Most historic machinery contains plain bronze bearings which will wear if not kept clean, dry, and continually lubricated. The building enclosing machinery may not have been designed to be of great architectural importance, being primarily functional in nature and simply designed to support or protect the machinery and store the product. But such buildings are visible elements of the landscape and can become objects of great affection, acquiring both historic interest and aesthetic value. Consequently, their treatment may be subjected to historic value judgements, either independently or as elements of the site as a whole. The machinery, being less visible, possibly less comprehensible, and perhaps derelict-looking, may be undervalued. In the past this sometimes led to notable cases in which a building became protected while its entire purpose, its machinery, was lost. Listing or scheduling a building confers protection on the whole building including all its fixtures, and therefore all historic machinery which forms part of the building is protected. But machinery has ancillary and detachable parts and so it is vulnerable to gradual loss through theft for scrap or people hunting for souvenirs or spares. When machinery falls silent it is thus vital to record and secure it by whatever means will be effective. Visitors must be effectively excluded from the vicinity of working machinery and properly supervised. Stationery machinery must be immobilised, not just turned off, if visitors are permitted to circulate nearby. Written operation and safety procedures for staff must be developed and periodically reviewed. If this cannot be assured, it may be necessary to dismantle the vulnerable parts, tag them, and remove them to a safer location. However, experience has shown this is a risky course of action as memories fade, records get lost, and components disappear, even in museums. Returning the machinery to working order is often a more sustainable solution. But there are advantages and disadvantages. It keeps the machinery intact. Most machines need to be substantially complete to work, and many require important ancillaries such as starting equipment, lubricants, lubricant filters, spares, tools, and other items without which the machine is not truly complete. It generates interest and so promotes care and maintenance both of the machinery and the building in which it is housed. It may be able to earn its keep by carrying out its original task and so contributing directly towards the cost of its care. This is particularly true of vessels, vehicles, and mills. Danger to staff and visitors: most historic machines were built to be accessible for maintenance, so guards were fitted only where absolutely necessary. As a result, most historic machines do not forgive a careless approach, and the consequences can be fatal. Wear and tear: most bearings involve one piece of metal sliding over another, so a film of lubricant must be maintained between them if wear is to be minimised. Despite this, wear is inevitable and irreversible, and ultimately may determine the life of a machine as non-renewable working parts become too weak or degraded to operate safely. Damage: catastrophic failure or accident may render machinery inoperable and ultimately irreparable. Cost: supervision, insurance, maintenance, fuel and other consumables may all be expensive. 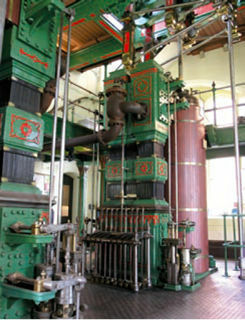 Blagdon Pumping Station, a 'cathedral of steam'. 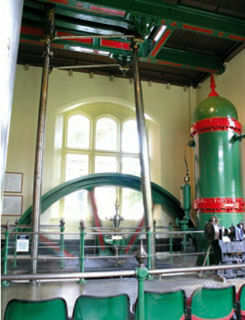 Two magnificent beam pumping engines by Glenfield and Kennedy of Kilmarnock were installed in 1902 to pump Bristol's drinking water. Still owned by Bristol Water Company over 30,000 visitors a year visit on summer weekends. No. 9 An air vessel evened out the surge of water delivered in three seconds by each pump-stroke, and a 6m diameter 20 tonne flywheel kept the Engine rotating a uniform 17rpm. The operational pumps are now electric, but most of the original features have been retained, including buildings, water mains, and cooling ponds. 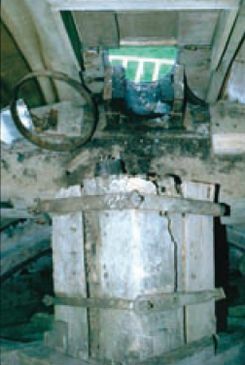 Preservation of machinery in working condition is therefore inevitably a compromise. It is vital to analyse the risks, and balance them against the returns, always bearing in mind that the aim is long term preservation. Wear may be reduced by not making the machinery work as hard as it once did. A stationary engine, for example, can 'tick over' with its driven machinery 'off-load'. Likewise, a wind or watermill designed to mill flour can demonstrate its modus operandi by rotating without actually grinding grain. Reducing the speed and/or load of historic machinery reduces wear and risk of damage, as well as the cost of fuel and consumables. However, idling machinery often becomes neglected and poorly maintained, and is often no less dangerous than when operating at full load and speed. Before adopting a course of action it is essential to carry out a thorough assessment of the potential consequences, including what might go wrong and the severity of the result, before examining how best to mitigate or manage the risks. There is no ideal solution, but the most comprehensive assessment can often be achieved by an experienced specialist liaising with those caring for the machinery. access for inspection, cleaning, and maintenance may be difficult or risky, and the machinery may be difficult to start, run or stop. unknowns may include the history of use/misuse of the machinery, and the condition of materials and internal parts. maintenance schedules (including cleaning, inspection, lubrication and housekeeping). These should be written, adopted by proprietors, issued to operatives, signed for by them and backed-up by appropriate training. Early timber components are rare and should be preserved wherever possible. 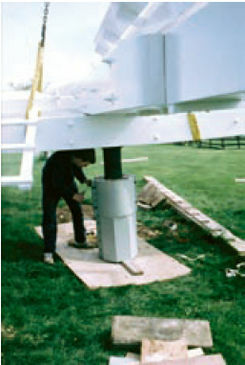 This wooden windshaft broke in a high wind and was repaired with a steel sleeve. It is essential that working machinery is under the control of one competent person who is accorded and accepts full responsibility for all aspects of the operation. (This is particularly necessary where volunteers, who tend to function by consensus, are involved.) Operation of complex machinery by 'committee' is dangerous, whereas clearly devolved responsibility, enforced with a degree of discipline, can enhance safety. The knowledge and skills required to operate traditional machinery often have to be re-learnt, putting the operator and machinery at risk. Contact with others having expertise, and training if available, are essential, and may be both legal and insurance requirements. There should be an established written routine before starting machinery for cleaning, lubricating, checking for obstructions and freedom to rotate (where applicable). Bolts, nuts, cottars, wooden teeth, etc, should be checked for tightness, covers and guards secured, and stock prepared for processing (grain for milling or water for pumping, for example). Working machinery must be supervised continuously. Unfamiliar noises during operation, changes in operating sounds, leaks and vibrations often provide warning of a problem and must be investigated immediately, usually requiring the machinery to be stopped. Working machines should be inspected periodically by an expert, usually every six or 12 months. to the operator who is expected to be familiar with the machinery, skilled in its maintenance and reasonably attentive. Localised guards or rails around particular hazards may suffice. to lay persons, that is to say everyone not trained and authorised to approach the machinery. This may require more comprehensive guarding, often at a distance from the machine, or enclosures either to secure the people or the machines. When the input of energy to a machine increases, or its driven-load decreases, it speeds up and may become dangerous. There must therefore be some form of speed-governing, which should be duplicated if not 'fail-safe'. It should be remembered that, if the drive to a governor fails (its drive belt breaks for example), an engine will speed up, putting its flywheel and bearings at risk. Machinery can only be stopped safely by cutting off its source of power. Often the point at which this is carried out is remote from the danger area, so additional measures may be needed, such as remote cut-off devices or emergency alarms. Shut-off arrangements should be backed-up if not 'fail-safe'. 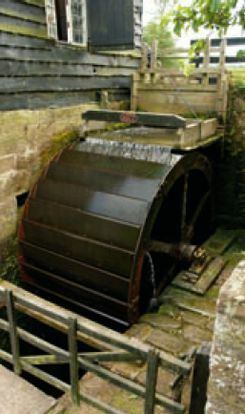 For example, what action will be taken to stop a waterwheel if its sluice-gate won't close fully due to intake of an underwater obstruction? Having a secondary means of damming off the water, or lowering the millpond level, may prevent serious consequences. Needless to say, the time to prepare for such an emergency is before starting the machine. Traditional 'plain' bearings comprise two materials sliding over each other, separated by a thin film of lubricant, without which the softer surface will wear. The lubricant is gradually lost from the bearing, so must be replaced continuously. Automatic replenishment is most effective and reliable, and usually a justifiable addition to most machinery. Where lubrication points are difficult or dangerous to access, they should be fed by pipes from a safer location. A machine is usually one of several components in a process system. For example, a water or sewage pump is part of a system for moving water from a lower to a higher level. If we define a machine as 'a mechanical or electrical device for carrying out a practical task', then its reservoirs, culverts, and pipe-work may therefore be considered to be part of the machine. However, for practical reasons they are often excluded from the preservation process. If we draw the boundary a little closer to the machine itself, it may be obvious that it is an assemblage of components in one place. This definition may work well enough for an internal combustion engine, but not where the fuel is burned externally, as in a steam engine, for example. The boiler is an essential part of the engine but may be sited in an adjoining building and become defined out because of the difficulty of preserving or maintaining it, and the costs involved. This problem is particularly acute with extended machines such as mine winders and pumps, haulage equipment and transport systems. It is therefore important to preserve as much of a working system as possible, rather than focussing on isolated items of machinery. It is one of life's great pleasures to discover an industrial building and then to find that it still contains its machinery. Even greater is the pleasure of learning that the machinery is still cared for, can operate, and can perhaps carry out its original function. Let's accord historic machinery the importance it deserves, and avoid the mistake of preserving buildings without the machinery that gave them purpose. This article is reproduced from The Building Conservation Directory 2006. It explores the issues to be considered where mills and other industrial archaeology can be kept in use. GEOFFREY WALLIS CEng MIMechE FRSA is a founder and director of Dorothea Restorations Ltd. Having started as a volunteer in his student days, he now has 30 years' professional experience in the conservation of historic mills, machinery and metalwork.